The set-up of the story, based on how Nanjiani and Gordon actually met in real life, is prove that life is often stranger than fiction. It lends itself perfectly for a RomCom, and at the same time without the assurance that it really happened, you’d probably question how realistic it really is (as far as realism plays into RomComs in the first place, that is). In any case, the story hits all the usual notes for the genre and is very much conventional in its structure and development. That’s not to say that this is a bad thing at all. In fact, it gives the unusual elements of the story more room, and that’s a good thing. It’s here where the movie shines the most: Kumail being from a Pakistani family gives us both a man of color as a romantic lead (which is much too rare and rarer still if you focus on brown men), and the opportunity to examine a lot of issues surrounding migration. It’s insightful without losing its sense of humor. The film also manages to balance an ironic look at its characters with real emotional impact. When films try to be funny, they often do so at the expense of the humanity of their characters, especially when they don’t take the characters all that seriously. Here we get a film that does make fun of its characters a little (in a loving way), but doesn’t lose sight of the fact that they still feel real emotions and that they’re going through difficult times. Even when things are a bit ridiculous. I, in any case, was emotionally very involved and really wanted to see all characters happy. Thus The Big Sick manages to make the conventional special again and that’s simply lovely. 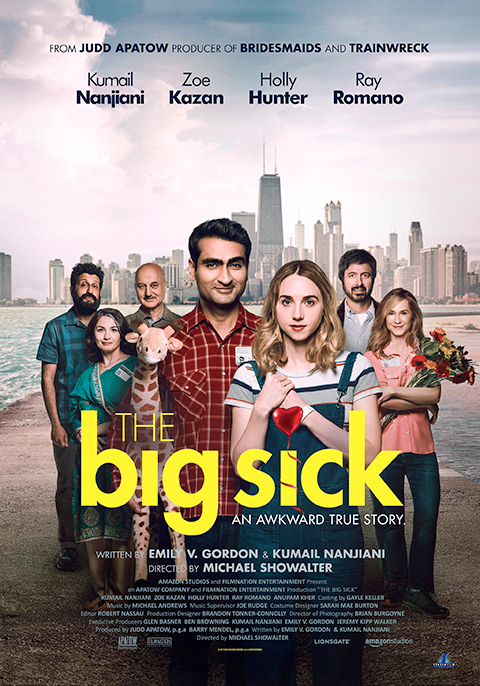 This entry was posted in movies and tagged 2017, Adeel Akhtar, Anupam Kher, Bo Burnham, Emily V. Gordon, Holly Hunter, Kumail Nanjiani, Michael Showalter, Ray Romano, The Big Sick, Zenobia Shroff, Zoe Kazan by kalafudra. Bookmark the permalink.